Halloween is upon us, and like every year I am pondering what or who to be for a party in which most guests usually go all out. My favorite last year was a guy dressed as Fu Manchu complete with the long fingernails. My husband is less enthusiastic and wants to know if putting an eye patch on is sufficient to pass for a “costume” to which I replied that he should just pull out the “Bah Humbug” Christmas sweater and go as the Grinch. I think I’ll just throw a couple of sheets with eye holes over both of us, practice my scariest “Boooooooooo” and call it a day. Some of the best costumes over the years emerged when I partnered up with another person. I mean, if you’re going to look like a dope, why go it alone? Costume partners can make the sum of the Halloween parts so much better. 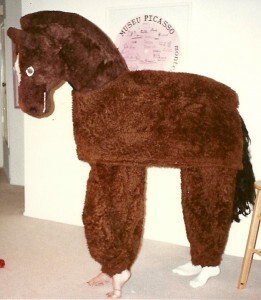 One year, I somehow talked a friend in to being a two-manned horse (see photo) for a friend’s annual Halloween bash. When we arrived at the party, Michael Jackson’s “Beat It” was playing and we danced our way through the crowd. Our legs were going in all directions and our giant horse head bobbed to the music. I am surprised we didn’t fall in to a big heap of brown faux fur. No one could tell who we were until I took off the head which was so hot underneath I thought I was going to pass out. Our ridiculous horse choreography had the party-goers roaring and I have never laughed so hard watching the video from that party. It wouldn’t have been the same without a friend who was willing to look like a horse’s rump right along with me. Each year, my favorite thing to do on Halloween is to walk around Balboa Island and watch all the adorable little kids in their costumes, the houses decked to the nines in spooky décor and neighbors sharing a glass of witchy brew. Some people think the good old days of kids going door-to-door and squeaking “trick or treat” are over. Not on the Island – Halloween is alive and well and if all the décor on the homes along the boardwalk is any indication, this year will be as spooky as ever. Some people like to dress up their pets, and surprisingly, the pets put up with this indignation at least long enough for a photo to be snapped and uploaded on to Facebook. I once tried to put a tiny jester’s hat on my cat Pete and needless to say, it didn’t go over too well. I still have a small scar on my hand from the scratch marks that resulted. I’ll never forget the sight of Pete walking away from me with that disgusted, “how could you? !” look. Our five pound Chihuahua, Charlie, seems to sense something scary on the horizon. When I pulled out a little pumpkin t-shirt, she ran in the opposite direction. I am guessing the cute little pink tutu I really was hoping to put on her is going to be completely out of the question. So this Halloween I’ll let the pets retain their dignity and see if I can talk the hubby in to partnering up on a clever costume concept but suspect I’ll end up keeping it simple and going with the ghost idea. If you see two bed sheets roaming the streets of Newport, you can probably guess who’s underneath.